AK: What is the purpose of the Spotlight Awards and how are you personally involved? JG: I am the Director of The Music Center Spotlight Awards. As Director, I do not act as a judge, although I set the criteria for judging with input from educators. I produce most aspects of the program with a wonderful staff, [as well as] educators and volunteers. I facilitate auditions and judging panels to make sure the process is fair to all students and that all judges have a “voice” in the final decisions. I also make sure the students feel comfortable in their auditions and that Spotlight provides them with a valuable learning experience. The Spotlight performance categories are ballet, non-classical dance, classical voice, non-classical voice, classical instrumental music and jazz instrumental music. The visual arts are included with the two-dimensional art and photography categories. We are hoping to add a theater category in the future. During the audition, our expert judges may offer specific comments about how the student can continue to improve. But in all cases, the student will receive a personal letter listing the specific feedback and suggestions of the judges. AK: What unique qualities do you look for in the competitors? JG: The judges for Performing Arts look for excellence in several distinct areas: Technique, Presentation, Musicality and Artistry. The technical aspects will be different for each category, and there are different judging panels for each category as well. Classical Voice judges do not judge Ballet, etc. Not all judging panels/casting directors, etc., will evaluate students in the same way. If a student were to audition for a university or conservatory, the judging panel would be looking for potential and if they would be a good fit for the school. If a student were to audition for a movie role, the casting director or producer would be looking for who gave the best audition and who would best fit the role the producers are trying to cast. The Spotlight Awards judges look for which students performed the best at their audition and whether they are ready to perform on stage. Some students are terrific technicians; however, they may not feel comfortable yet in their performing abilities. That is why many students audition for Spotlight all four years they are in high school. The written feedback they receive from the judges is a valuable tool as they continue their artistic studies with their teachers and coaches. AK: Describe some of the things past winners have achieved and how you think the awards assisted them in achieving these successes. Do you think that the Spotlight Awards were a motivating force for some finalists’ eventual achievement of professional careers? JG: This is a very interesting question! We have many alumni who go on to achieve the most amazing things! 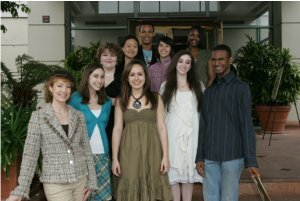 Sixteen of our alumni are Presidential Scholars; many have performed on Broadway; many more are now with professional companies such as American Ballet Theater, The Metropolitan Opera, The New York Philharmonic, and Alvin Ailey American Dance Theater. Several have recording contracts in both singing and instrumental; the list goes on and on! I know that some of our students have expressed to me how important The Spotlight Awards has been for them, in terms of helping them focus and commit to their life’s passion. Would they have achieved greatness without Spotlight? I would have to say, Yes!! We feel very honored to have shared in their dreams and helped them in their early development. For some students, Spotlight has given them great confidence and spurred them on to achievement. They may not have felt they could really “go for it” without the push from our program. Sometimes, all it takes is one person who shows an interest in you to fill you with confidence in your ability. AK: Who was the greatest inspiration in your decision to pursue an acting career? JG: I started out in life as a ballet dancer. I had a very bad injury at eighteen which ended my ballet career. After the injury, I spent a lot of time watching movies. My mother had me watch musicals, which I adored! They healed me and helped me learn that I could express myself through my voice and not just through dancing. I was also inspired by dramatic actors such as Jane Fonda, Diane Keaton, and Meryl Streep. I was awed by how I could lose myself by watching these performers. I then went back and watched old movies from the thirties and forties starring actors like Bette Davis, Joan Crawford, and Vivian Leigh. They were so real to me, and that’s when I fell in love with acting! I defy anyone to watch All About Eve, and not fall in love with acting!! AK: Have you always wanted to be a professional actress? How do you think your experiences in acting have helped you judge others? JG: I came to want to pursue acting in my early twenties; however, I think I secretly wanted to act my whole life. When I was young, I would come out of every movie my parents took me to and I became the character I had just seen. Queen, space explorer, peasant, waitress; it didn’t matter! I was all of them! I was so focused on ballet that I didn’t think anything of it at the time. I have frequently acted as a judge for other competitions, aside from The Spotlight Awards. I understand what an artist must go through in order to audition. It can be very scary for some people. I have the utmost respect for actors and all artists. Anyone who pursues a career in the arts is usually a sensitive individual. I say that as a positive! So often when we say someone is “sensitive”, we imply that they are weak in some way. Actually a sensitive person is very intuitive and thoughtful. They notice things that most people do not. They are in tune with feelings and have the ability to express those feelings in a way which most people are not. A good actor has the ability to make the audience look at themselves in perhaps a new way and help them to think differently about something. Throughout history, that has been the role of the artist. The artist reflects back to us what is going on in the culture. When I sit on a judging panel, it’s important to me that whoever is auditioning, that person should know their work is appreciated and that although they may not be right for the role or show, they are valued. Unfortunately, casting directors are extremely busy people and under much pressure to bring in the right people to the producers. They sometimes forget that in order to have the artist bring in their best work, the casting director has a responsibility to create a good artistic environment for the best work to come through. AK: What have you learned from working with teenagers in the competition? JG: My favorite part of my job is working with teenagers. Because I studied dancing from the time I was four years old, I understand what it feels like to have intense dedication to an art form at such an early age. I feel lucky that I get to meet and talk to young artists who feel such passion about what they aspire to do. Most people don’t have a clue as to what they want to do in life, until they get to be much, much older. How amazing is it to wake up every day knowing that each day brings you closer to your dreams! The students I meet inspire me every day! My judges say the same thing about the students! I think that as we get older, we forget how wonderful it is to have dreams and then actually pursue them. We get cynical and then we just lose faith in ourselves. It’s hard to be a grownup with all the responsibility that comes with that and still retain youthful energy and passion. Teenagers remind us to stay young in mind, body and spirit! Most parents do not fully understand their child’s passion because they may not have had those feelings when they were young. I think parents worry about whether their child might miss out on having a “normal” childhood. I never felt like I missed out on anything because all I wanted to do was dance. I couldn’t wait to go to dance school after regular school. Parents may also worry about an artistic career path for their child. Will the child be able to support him or herself; will they be able to get into a good college, etc. An artistic path does not always mean being in front of the camera. Many performers become writers, directors, producers, educators, or go on to any number of successful careers. I do counsel all students, who come through The Spotlight Awards program, on the importance of education. I’m passionate about getting a good education. It’s so important to your future, whether you pursue an artistic path or not. Going to a college or university will only add to your life experience, which then adds to your artistry. AK: If you could choose your favorite experience as the Director the Spotlight Awards, what would it be and why? JG: I have so many favorite experiences!! Spotlight is so much more than a competition. I’m very interested in all the students; not just those who advance to the semifinals or finals. I want them to feel good about themselves and all that they have accomplished. I want their self worth and self esteem to stay intact before they walk into an audition room, during their audition, and when they walk out of the room. What are they saying to themselves before they walk into an audition room? What is their breathing like? How do you overcome nerves when you are auditioning? How do you think about yourself if you don’t get a part you wanted? These are the things we explore in Spotlight with the students. I had a judge once who was very well known and had cast many shows. After watching one of our auditions, he said to me, “I didn’t know auditions could be like this, so easy and warm!” He was inspired to hold his own auditions in the future much like we do. This made my day!! We are turning around the future of auditions, one judge at a time! !